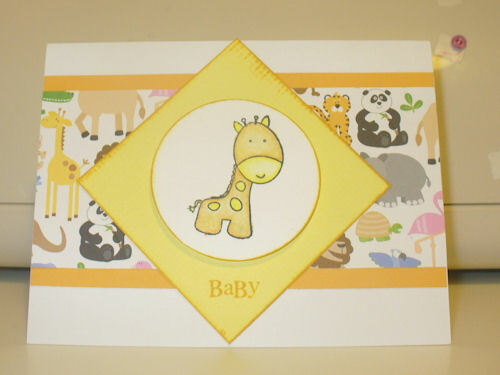 Here’s a baby card that I had blogged about on 08/03/09. 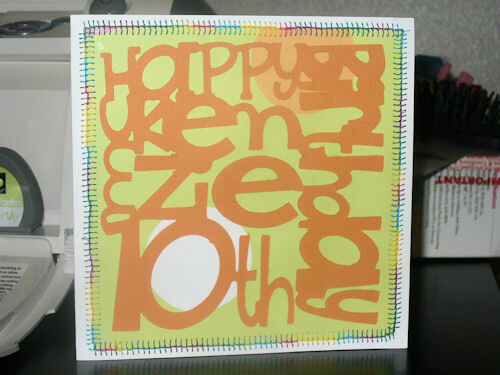 I believe the orange paper is made by Papertrey Ink in the “Summer Sunrise” color and the yellow is Bazzil cardstock. The griaffe stamp is from an unknown designer and is stamped in black. I colored it in with my Prismacolor pencils; Goldenrod (PC1034) and Canary Yellow (PC916), and was blended with a Prismacolor blending marker.”BABY” is from Papertrey Ink’s “Mixed Messages” set, and is inked in Close to My Heart’s Honey; as well as the edges of the yellow diamond. The animal cardstock is some I picked up from my local crafting store, and the base of the card is Georgia Pacific brand. The card was made to fit into an A2 envelope. Here’s a picture of a card of a set that I had made on 07/05/09, blogged about on 08/02/09. The white base of the card is a 6″ by 6″ of cardstock folded in half made by ProvoCraft. The plaid papers are from DCWV’s Grade School stack; they were cut into 1″ by 1″ squares, and then two corners were rounded off with a corner punch. The blue square was cut from a sheet of Bazzil cardstock at 1.5″ by 1.5″ and also had two corners rounded. 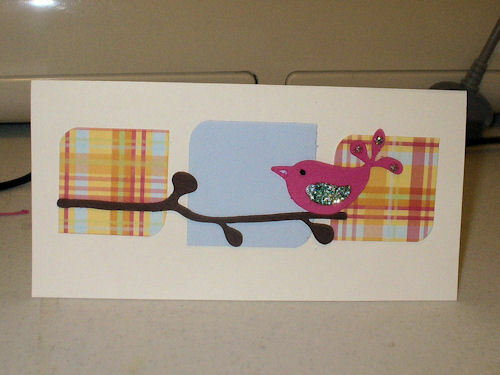 Both the bird and branch were cut out with my Cricut machine using the “Home Decor” cartridge. The bird had legs, but I felt that it would look better if they were snipped off to sit on the branch. The eye was made with Scribbles stickles in black, and the wings and tail feather accents were applied with Ice Stickles in the “Mint Ice” color. I made custom sized envelopes for the cards. Punk Inspired Baby Shower invitations for a friend's baby shower. Baby shower inviation orginally blogged about on 10/07/08. My friend Ngaire was expecting her first child, and I had volunteered to make her baby shower invitations. She’s not exactly into the typical cutesy baby stuff; her taste tends to lead towards indie/mod/punk and I wanted to make sure that her baby shower invitations reflected this. The baby and the bundle were both cut from my cricut machine using my “New Arrivals” cartridge; cut at 3″ tall. The face is from a stamp by a company called peachy keen; and the “you’re invited!” at the bottom of the invitation were actually rub-ons instead of a stamp. And of course, to make the baby look punk-ish, I used a pink marker to give the baby pink hair! The card was made to fit into an A2 sized envelope. Card I made for my niece's 10th Birthday. Card I originally blogged about on 10/03/08, with a preview of the cutfile on 07/26/08. I made this card using my cricut machine, full version of cricut design studio with the “Cuttin’ Up” cartridge; I utilized a few different fonts found on that cartridge. The letters are in an approximately 5″ by 5″ and layered on a piece of patterned cardstock cut at 5.5″ by 5.5″ and the card base was cut to 6″ by 12″ and folded in half for a final dimension of 6″ by 6″. I then used some rainbow variegated thread, and using a decorative stitch on my Babylock Xscape machine, I stitched around the patterned paper. I didn’t have any envelopes that would fit the card; however there are envelopes out there that you could buy to fit a square card. Card I made for a swap for twin girls in mind. This is a card I originally blogged about on 07/09/08. However the card was made in May or April of 2008. 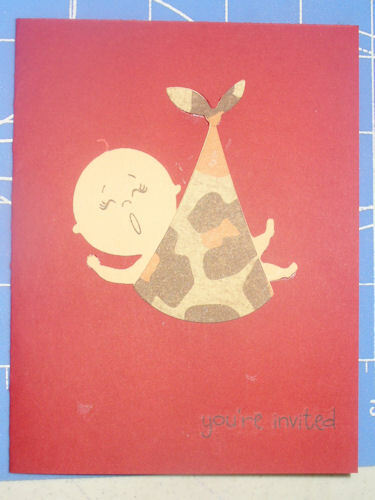 I made this for a card swap I participated in online with a theme of “babies”. 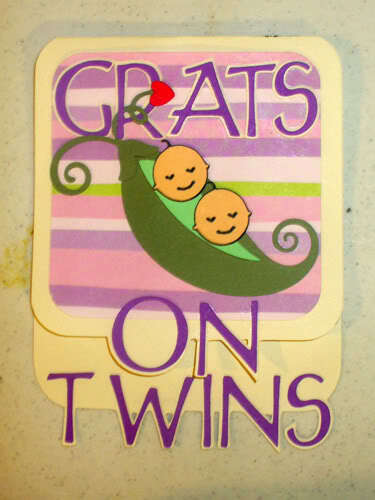 One of the ladies in the swap was discussing how difficult it was for her to find cards to congratulate parents of twins, so I made this card with her in mind and with the hopes that she would end up with the card. This card was made using my Cricut machine, and the trial version of Cricut Design studio; at the time I only had the original Cricut machine. The letters were made with my “George and Basic Shapes” cartridge as the base of the card, and the pea with the two heads in the pod were cut from my “New Arrivals” cartridge. There was some trial and error and reverse thinking done to create the card base, but ultimately it worked out. The babies’ faces were outlined by loading a cricut marker into my machine instead of the blade and blade housing. The card was made to fit into an A2 sized envelope. Card I made for my nephew's 4th birthday. 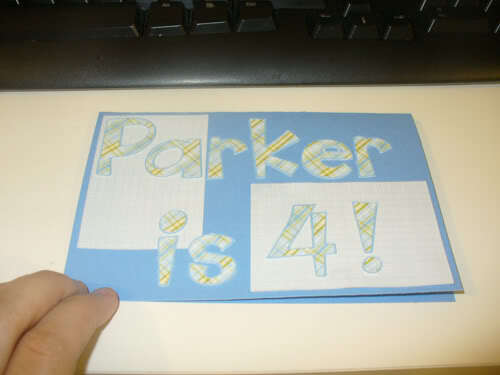 Card that I made for my nephew Parker’s 4th birthday; I originally blogged about it on 07/08/08. I created this card using scraps of double sided patterned paper, DCWV textured sticker paper and blue cardstock by Provocraft. In addition, to cut the letters out, I used my Cricut Machine and “Cuttin’ Up” cartridge. The card was made to fit into an A2 sized envelope.